Will raising the minimum wage to $15 an hour kill jobs? 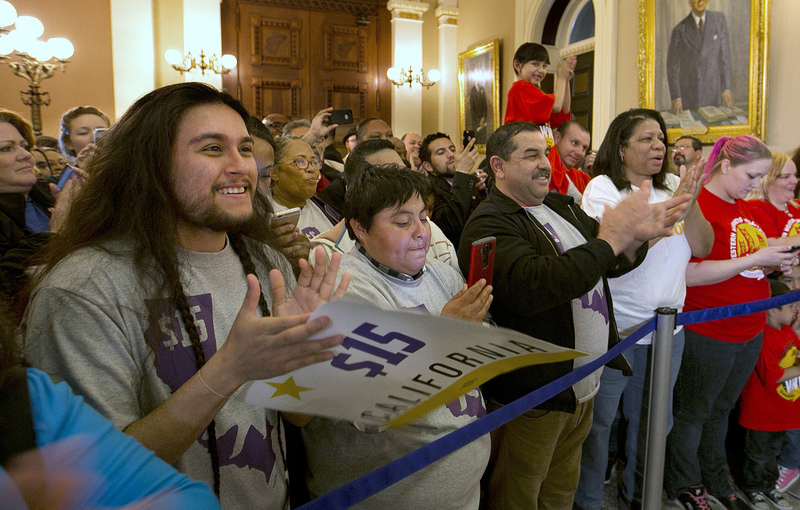 A move by two of the nation's most populous states to gradually raise their minimum wage to record levels is rekindling debate over the impact that could have on jobs. In California, Gov. Jerry Brown on Monday is expected to approve a statewide minimum wage of $15 an hour to take effect in 2022, while New York Gov. Andrew Cuomo and state legislators have reached a similar deal. Although unions and labor activists are cheering the wage hike, some small business groups are expressing concern. "It's not like small business owners have this vault in their garage that they can go to," Tom Scott, executive director of the National Federation of Independent Business/California, said. "Nobody wants to hear the reality here," he added. "Legislators can go back to their districts, which are heavily populated with small businesses, and have them explain why this did this." The NFIB/California says that more than 90 percent of the 22,000 small businesses it represents in the state oppose the wage hike. The group predicts the pay increase will lead to layoffs and price hikes, as well as force some employers to close their doors altogether. The right-leaning American Action Forum estimates California's move could cost the state nearly 700,000 jobs. Among many business owners, the link between wage hikes and layoffs is self-evident. That view was once shared in liberal quarters -- in 1987, for example, the New York Times opposed raising the federal minimum wage to $4.35 an hour because the newspaper believed it would cause unemployment to rise. But research since then suggests a more ambiguous relationship between pay and employment. An influential 1995 study by economists David Card and Alan Krueger -- who looked at 410 fast-food restaurants in New Jersey and eastern Pennsylvania before and after New Jersey's minimum wage rose from $4.25 to $5.05 an hour -- found "no indication that the rise in the minimum wage reduced employment." As public opinion has turned more in favor of raising worker pay, so has the makeup of the low-wage labor force in the U.S. Minimum wage is no longer chiefly for teenagers in need of a little spending money and job experience. Today, between 70 and 80 percent of minimum wage workers are above the age of 25. The Center for Labor Research and Education at the University of California, Berkeley also projects that more than a third of the 2.2 million Californians now earning the minimum wage are parents. There are two key questions in assessing the impact of raising the minimum wage, "what we know from past history, and what do we expect from these new sets of increases that we're seeing," Ben Zipperer, research economist at the Washington Center for Equitable Growth, said. The growing consensus is that significant negative employment effects of a rising minimum wage are hard to detect, he said. "The size of the average employment effect of studies published since 2000 is very small, instead of being very negative and large." When the minimum wage is raised, the effect on individual businesses is lessened because their competitors also have to raise wages, economists say. And, while fewer workers are hired, fewer leave, lessening the need to recruit and train workers. But there are limits to what can be gleaned from the past, and economists including Zipperer are less certain of the ramifications of taking the federal hourly minimum wage from $7.25, where it's held for seven years, to $15 as labor activists advocate. "The research doesn't speak to what the effects of a $15 national minimum wage are," said Zipperer, who favors raising the baseline wage to $12 by 2020. In pre-tax dollars, $15 an hour for a full-time job equates to monthly pay of $2,600, or annual salary of $31,200; $12 an hour adds up to just under $25,000. How far that money goes depends in part on where workers live. One way of gauging the impact of the minimum wage is to compare it to the middle, or median, in a given area. California's plan to hike to $15 by 2020 represents a modest increase in San Francisco, for instance, where many workers already earn good pay. In a rural area, with relatively low pay, the impact will be broader. Krueger, speaking at an event last month hosted by the Washington Center for Equitable Growth and the Economic Policy Institute, also said the economic effects of a $15 minimum wage are unclear. "Twelve dollars is probably the outer end of that range in today's dollars. If you go beyond that, we are in unchartered waters." "From a self interest point of view, I can see why some employers take the position that they do. Many others are more enlightened and look at the impact on the economy as a whole," Krueger added. Confidence among small to midsize businesses has soured in recent weeks amid volatility in the stock market and presidential campaign rhetoric, a survey released this week by PNC Financial Services (PNC) found. Still, one in four companies expects to hire additional workers in the next six months, and 45 percent expect profits to increase in the months ahead. "As of now, some of the minimum wage hikes as well as everything else in the economy has not impaired the profitability of small businesses," Stuart Hoffman, PNC's chief economist, said. "The federal minimum wage not having been raised since 2009 is falling behind even the slow inflation we have seen for the past seven years," he added, noting that he favors periodic increases in the federal minimum indexed to inflation.